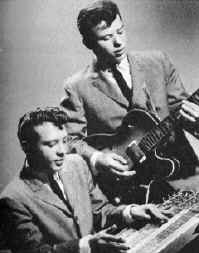 Santo and Johnny's biggest hit was "Sleep Walk". Santo and Johnny Farina were brothers born in Brooklyn, New York, Santo October 24, 1937 and Johnny April 30, 1941. As a boy Santo Farina listened frequently to the "Hometown Frolics," a country radio show. Through that association he came to love the sound of the steel guitar by the time he was teen. Santo convinced a neighborhood music store to modify and acoustic guitar to allow him to play it like a steel. Santo was mesmerized with the sounds he could produce on his new guitar and practiced day and night. Within two years, he was performing for amateur shows on a new Gibson six-string steel guitar. Soon after, he acquired a steel guitar teacher who had learned the art in Hawaii. In 1952, at the age of fourteen, Santo formed an instrumental trio with a guitarists and drummer. By this time he was composing songs as well as the hits of the day. He also included a few Hawaiian standards when the group played at local dances and parties. With money he made from performing he bought another steel guitar. This one had three necks, each with eight strings. He experimented with the additional two strings until he came up with tunings that appealed to him. It was at this time Santo began teaching his younger brother Johnny, to play accompaniment on a standard electric guitar. The Farina Brothers began to gather fans from Brooklyn to Long Island. As their popularity grew locally they recorded a couple demo tapes. Johnny made the rounds of the New York record companies. The brothers came to the attention of a music publishing company and signed a song writer's contract. This lead to a contract with Canadian-American Records. Their first release "Sleep Walk" was composed by the brothers with help from their mother. After ten years of trying Santo was prepared for success. The brothers were booked on coast-to-coast tours and television shows. Their first album was a hit as was their second single, "Teardrop." Their fame spread to other countries and they were booked on tours of Australia, Mexico and Europe. In the US, their record sales began to wane by the end of 1960. There was a resurgence of popularity in 1964 with an album of songs made famous by the Beatles. Canadian-American Records released a total of nine albums before it folded in 1965. In 1966, Santo and Johnny were briefly associated with United Artist Records, before switching to Imperial in 1967 on the strength of their international sales. In 1968, Imperial closed after the release of their fourth album.